Some say this is most beautiful shell in California. The snail who calls this shell home can be found from the low tide zone to a depth of 150 feet. They grow to approximately 2-1/2 inches and hide in cracks and crevices in the reef during the day. They have an orange colored mantle with small black spots that can be seen enveloping the shell when the shell is not disturbed. 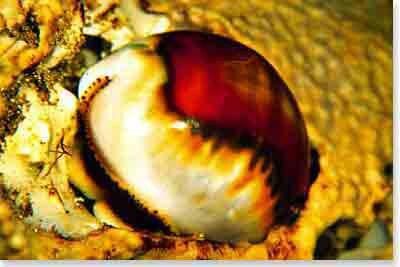 The entire animal can be drawn into the shell for protection exposing the shiny brown and cream colors of the shell. The bottom of the shell has a series of “teeth” that run the length of the opening. These snails are carnivores, feeding on sponges, anemones, bryazoans and other tiny invertebrates. The cowrie can be found from Point Conception (rarely as far north as Monterey) to Baja California. Photo courtesy of Tom Haight.